HERE THERE BE SPOILERS! Also, merchandising! This is the second of our story critique episodes. 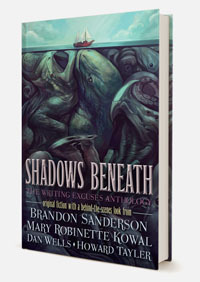 The story, “Sixth of the Dusk,” is available as part of SHADOWS BENEATH, the Writing Excuses anthology, which includes the finished story (obviously) and the version we critiqued in this episode. SHADOWS BENEATH also includes the stories we’ll be critiquing for the rest of July’s episodes, and some other pretty cool stuff that you can read about here. If you purchase the hardcover, we’ll send you the ebook at no additional charge. Can you get a lot out of this episode without having done the reading? Yes! But we don’t know what those things will be. Can you get a lot out of this episode without having listened to Part 1? Probably, but here’s a link to it in case you have doubts. Having covered the stuff we loved in Part 1, this episode is the big downer where we just focus on the problems we found. But hey, that’s how stories get to be better! We start with the big ones, and then work our way back up to the little things. Have a man who plays the musical saw find more than one additional use for the saw during the story. I haven’t listened to the episode yet, but I have completely second the Audible rec this week. The White Trash Zombie series is utterly delightful, and I highly recommend it to everyone. I wanted to give Brandon a poke here. After listening to this (and the previous episode) and then reading his “Fixing Sixth of the Dusk” essay, I actually have an idea of what is wrong with a fantasy novelette I am working on – mainly that, like Sixth, my climax is not my ending (like I thought it was). It was exciting to be able to identify that. I’m thrilled looking forward to hear the session on Mary’s story, since I took the oportunity to participate when Mary posted her draft on her website, so I’m curious about what you noticed and commented upon. A cut here, a foreshadow there, maybe a bit more motivation… Slice and dice, make that story stand out! Aka, a critique session. Also available in the archives. The one thing I’m a little confused on is how the ending was changed, but foreshadowing leading up to it wasn’t… basically, if the map wasn’t going to blow up nuke-style, why was there a huge chance of imminent death? I have a question about absorbing new material. Now I know you are all biased towards Audible.com which is understandable, which I am a customer, no thanks to your show, but here is my question. When you mention that new/existing authors should absorb as much material as possible, in order to grow our skills, do you think that one method of absorption is better than another? For example I have been listening to what I deem more entertaining books off of audible but buy digital/print copies of books I want to use more as a reference/guide. Do you think that one way is truly better for assimilation or is that just my biased preferences? I recommend to my students that they try different things — listen, read, make notes, make outlines, make graphs and visuals, or whatever — and see what works for them. We have some pretty good evidence that people do tend to use certain forms, written, oral, visual, and some different learning strategies, and that one way does not work for everyone. Which means you have to take charge of your own learning. So, my advice would be try different ways and see what works for you. And as you point out, it may be different for various kinds of information, too!